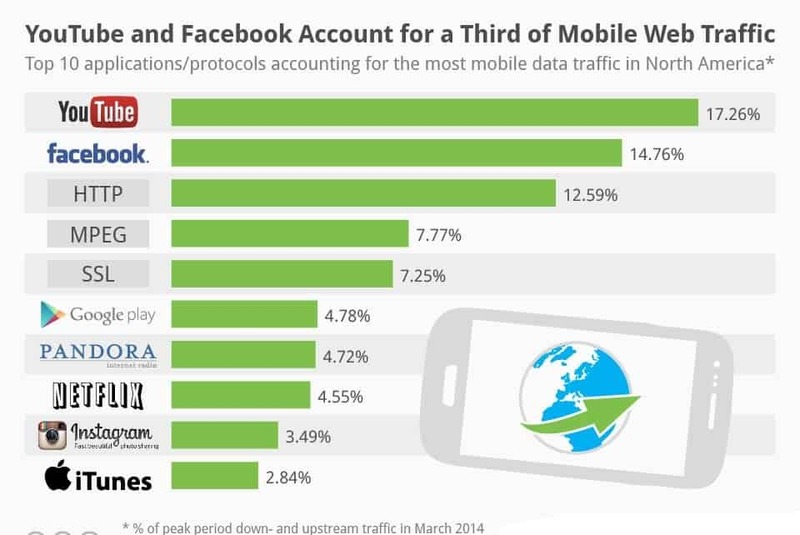 Increasing number of people shifting to a mobile device to upload photos to Facebook and watch cat videos on YouTube has made these two channels to get the maximum amount of mobile traffic as of May 2014. According to a report generated by Sandvine, 32% of data sent to and from mobile devices happen on Facebook and YouTube. Individually, Facebook’s share was 26.9% for upstream traffic and had a 14% share for downstream traffic, while YouTube only had 3.7% share for upstream traffic, but a 17.6% share for downstream. Facebook’s high upstream traffic shows that users are uploading photos and videos from mobile devices more than ever before on it. YouTube’s downstream traffic share has not changed from that of last year which was 17.7%.